Configure a matrix of up to 16 x 16. 12G-SDI compatibility across all inputs and outputs. Optional AVDL functionality enables smooth changeover without noise or disruption. Conventional 3G-SDI routing switchers require 4 crosspoints to input and output 4K video. With 12G-SDI, 4K can be carried over a single crosspoint. The MFR-1000 also determines the type of SDI input automatically—no need to worry about what signals are supplied. 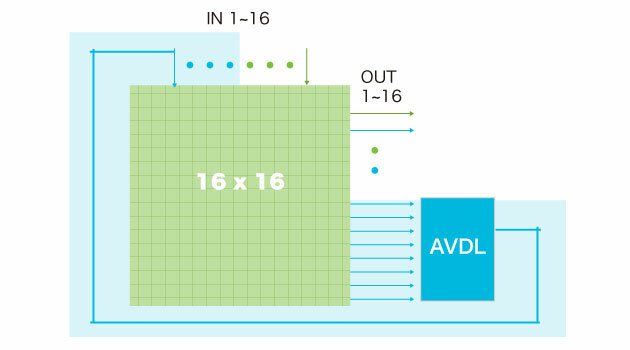 AVDL functionality* can be added to 8 outputs, enabling smooth changeover without noise or disruption. Produces clean switched output for video input within the adjustment range. Built-in webserver enables immediate setup without installing software on external devices. Via this interface, settings can also be configured in an offline environment. Front panel enables menu display and notification of alarm details. Remote-controllable through the Ethernet or serial ports. Compatibility with common protocols such as TSL and Harris enables tally linkage or auto source name tracking for crosspoint switching. As well as our exclusive interface to the FOR-A line of HVS production switchers and standalone multi viewers. Supports 8 inputs of 12G/6G/3G/HD/SD-SDI and DVB-ASI. Supports 8 outputs of 12G/6G/3G/HD/SD-SDI and DVB-ASI.